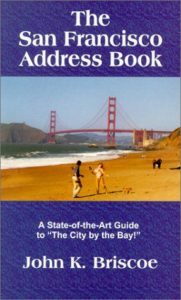 The San Francisco Address Book–A State-of-the-Art Guide to “The City by the Bay! San Francisco is one of the most exciting cities in the world! It’s also a complex place, with enough activities to last most visitors a lifetime. How do you choose from hundreds of restaurants, parks, museums, and unique landmarks, such as “the Crookedest Street in the world,” and the monument to the City’s Fire Department: Coit Tower? And once you’ve made up your mind on where to go, you need to figure out how to best get there. This book was created to help you get the most out of your visit. The authors list “10 Things for Kids”, “10 Places for Seniors,” “10 Places to Avoid,” which tells you where NOT to go in the City, and “10 Helpful Hints,” with tips on how to deal with everything from Earthquakes to “Critical Mass” (which has nothing to do with atomic fission! ), as well as the best type of clothing to wear (keyword: Fog! ), what those beautiful Rainbow Flags mean, and where to find an all-night pharmacy / convenience store. Almost every listing includes a Web Site. The San Francisco Address Book is definitely a visitor-friendly, insider’s guide to that spot where Tony Bennett and millions of other residents and visitors have left their hearts!